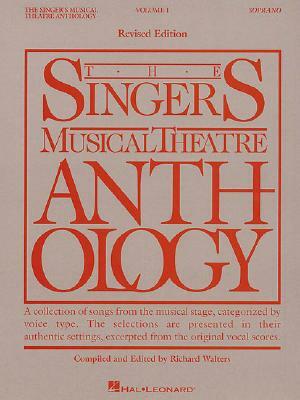 The Singer's Musical Theatre Anthology Volume 1: Soprano Book Only (Singer's Musical Theatre Anthology (Songbooks)) (Paperback) | The Drama Book Shop, Inc.
(Vocal Collection). The world's most trusted source for great theatre literature for singing actors. The book features nearly 50 authentic editions of each song in the original keys. The songs have been carefully chosen for each voice type and are culled from a wide selection of classic and contemporary shows. This book also includes access codes to online recordings of piano accompaniments for each piece. The audio is available for download or streaming. Contents: ALLEGRO: Come Home * BABES IN ARMS: My Funny Valentine, Where or When * THE BOYS FROM SYRACUSE: Falling in Love with Love * CAMELOT: I Loved You Once in Silence, The Simple Joys of Maidenhood * CAROUSEL: If I Loved You, Mister Snow, What's the Use of Wond'rin', You'll Never Walk Alone * CELEBRATION: 66 Under the Tree * CINDERELLA: Ten Minutes Ago * THE FANTASTICKS: Much More * FIDDLER ON THE ROOF: Far from the Home I Love * FLOWER DRUM SONG: 84 Love, Look Away * FOLLIES: One More Kiss * A FUNNY THING HAPPENED ON THE WAY TO THE FORUM: That'll Show Him * HAPPY END: Surabaya Johnny * THE KING AND I: Hello, Young Lovers, My Lord and Master, Something Wonderful * KISS ME, KATE: So in Love * LADY IN THE DARK: My Ship, The Saga of Jenny * ME AND JULIET: No Other Love * MERRILY WE ROLL ALONG: Not a Day Goes By * THE MOST HAPPY FELLA: Somebody, Somewhere * THE MUSIC MAN: Goodnight, My Someone, My White Knight, Till There Was You * MY FAIR LADY: I Could Have Danced All Night, Show Me * OKLAHOMA : Many a New Day, Out of My Dreams * ON YOUR TOES: Glad to Be Unhappy * 110 IN THE SHADE: Old Maid * PORGY AND BESS: Summertime * ROBERTA: Smoke Gets in Your Eyes * SHOW BOAT: Bill, Can't Help Lovin' Dat Man * THE SOUND OF MUSIC: Climb Ev'ry Mountain * STREET SCENE: Somehow I Never Could Believe, What Good Would the Moon Be? * SWEENEY TODD: Green Finch and Linnet Bird * THE THREEPENNY OPERA: Barbara Song, Pirate Jenny, Solomon Song * TWO BY TWO: The Golden Ram.